FINALLY getting back to reading after a busy end to my internship and then a week of just being out of it. I took a break from my Finnegans Wake reading and my tear through the Song of Ice and Fire series to check out this highly recommended dark-comic Western. I absolutely loved it. Clearly drawing on Cormac McCarthy, deWitt realizes he cannot capture McCarthy's almost Russian gift for human profundity in minute observation and instead strives to tell a more intimate story of two brother hitmen out on a task routinely interrupted by bleak oddities. It starts off hilarious, twisting that McCarthy style into deadpan humor with greater aplomb even than the Coen brothers' take on No Country for Old Men. 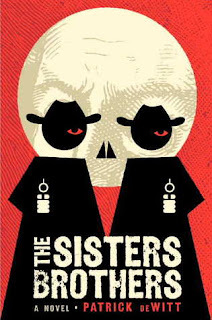 Yet the closer it gets to its destination, the more The Sisters Brothers becomes an affecting, insightful view onto filial bonds, strained by differing, sometimes diametrically opposed, personalities and ambitions yet unbreakable and endlessly supportive. Even the sideplot about Eli's put-upon horse Tub is oddly touching, each new indignity suffered by the poor beast a fresh blow. I cared about that pathetic creature as much as I did the protagonists, which is an impressive feat in its own right given their reprehensible lives and the sad banality of Eli's inner narration. This book has been a huge hit lately among a lot of people I follow on Twitter, and I can see why they raved about it. One of my favorite contemporary reads.